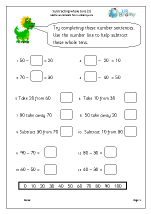 Introducing subtraction using small numbers and vocabulary such as ‘take away’, ‘how many are left?’ and the subtraction sign. 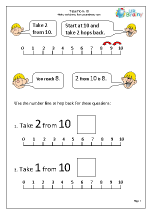 Number lines are a great resource to help with subtraction. 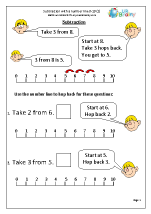 Children can 'hop back' along the line, counting back aloud as they go. 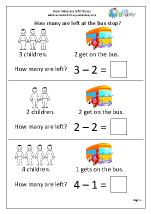 Many schools are now using bar modelling as an intermediate step between subtraction using objects and the abstract subtraction sentence (e.g. 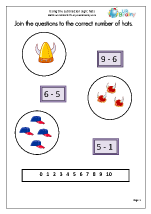 6 – 2 =). 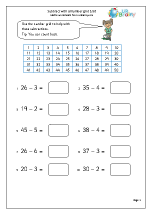 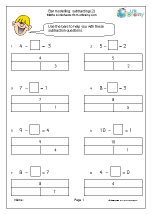 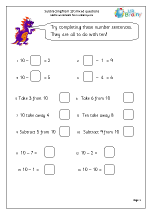 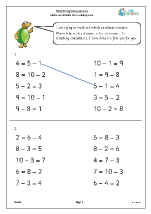 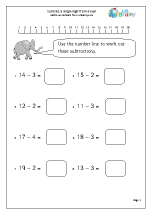 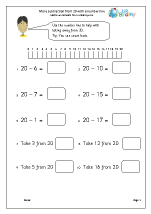 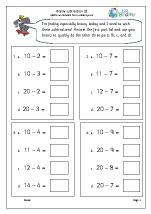 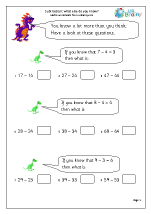 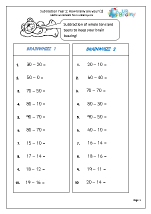 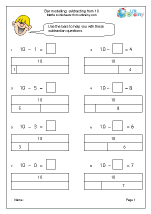 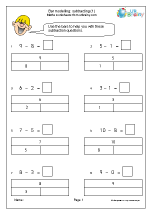 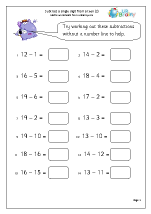 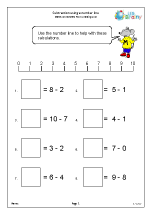 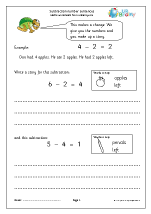 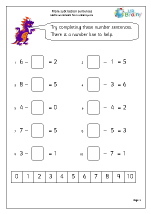 Practice pages and tips to help with subtracting mentally quickly and correctly. 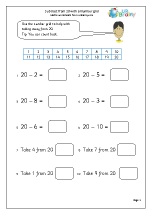 The ultimate aim is that children will know simple subtraction facts 'off by heart'. 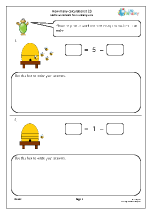 Activities which really help with improving subtraction skills, plus some subtraction with larger numbers and ‘intelligent practice’ for the more able. 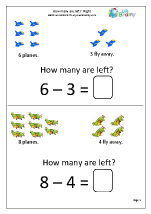 Subtraction: what else do you know? 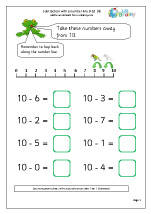 A key feature of Maths in Year 1 is to understand the process of subtraction and to have a rapid recall of subtraction facts with small numbers. 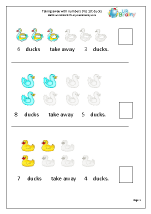 The best way to achieve this is by practising on a regular basis. 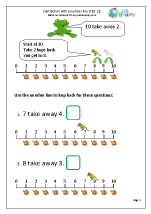 If this is mastered in Year 1 then children should have no problems with subtraction later when numbers get larger. 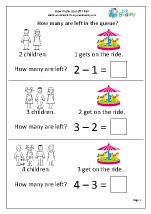 Many people find subtraction much harder than addition, but in reality we can solve many subtraction problems by adding, or counting on, and this is one of the ways young children learn to subtract. 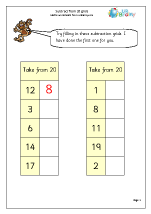 Knowing addition facts will allow children to work out subtractions (eg if 5 + 3 = 8, then 8 - 5 = 3). 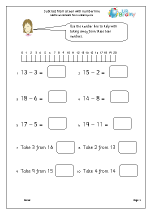 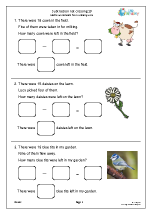 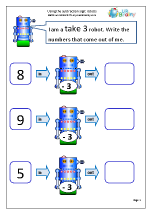 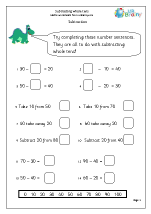 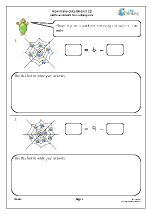 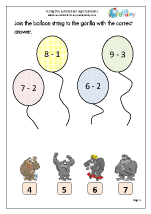 We have already got a great selection of bright and cheerful subtraction pages for Year 1 but to give you even more choice we have just added four great new sets of worksheets. 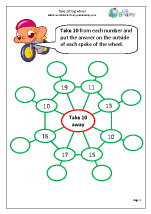 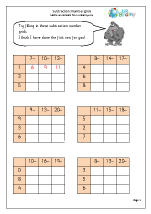 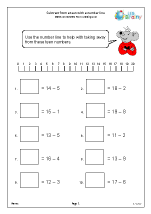 These include subtraction with numbers in the teens, more quick answer ‘Brainwhizz’ pages and using subtraction grids.